Hiya guys! I can't believe we're already about to close out another month. It's like time is flying by so quickly this year I can barely manage to keeping my days straight. With Easter just around the corner there are some polishes to celebrate the bunny madness. 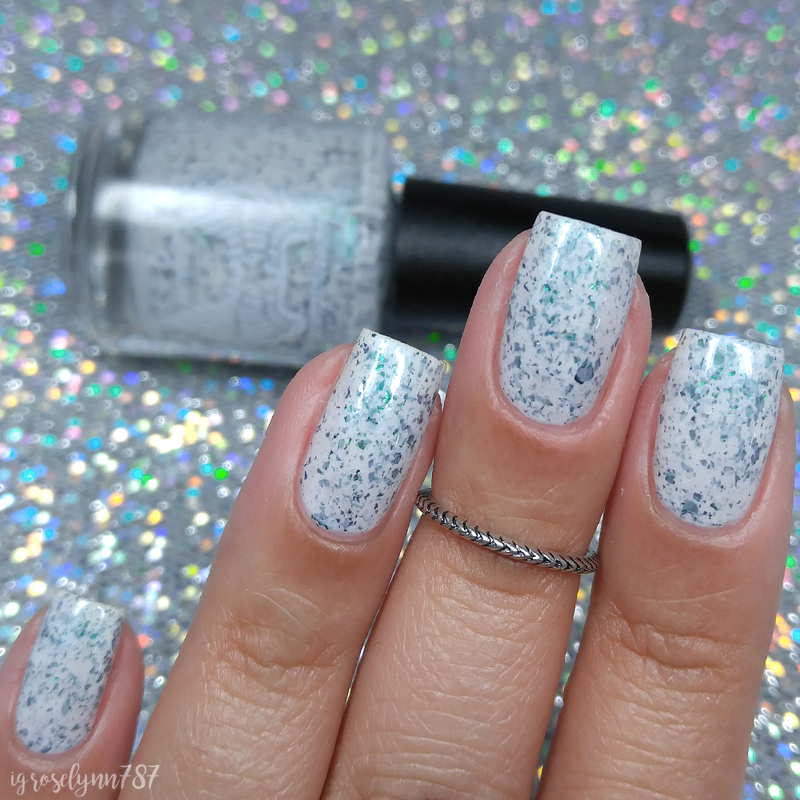 Today I'm sharing swatches for the gorgeous Mythical Egg Trio by Supernatural Lacquer, which consists of three flakie filled white crellys. 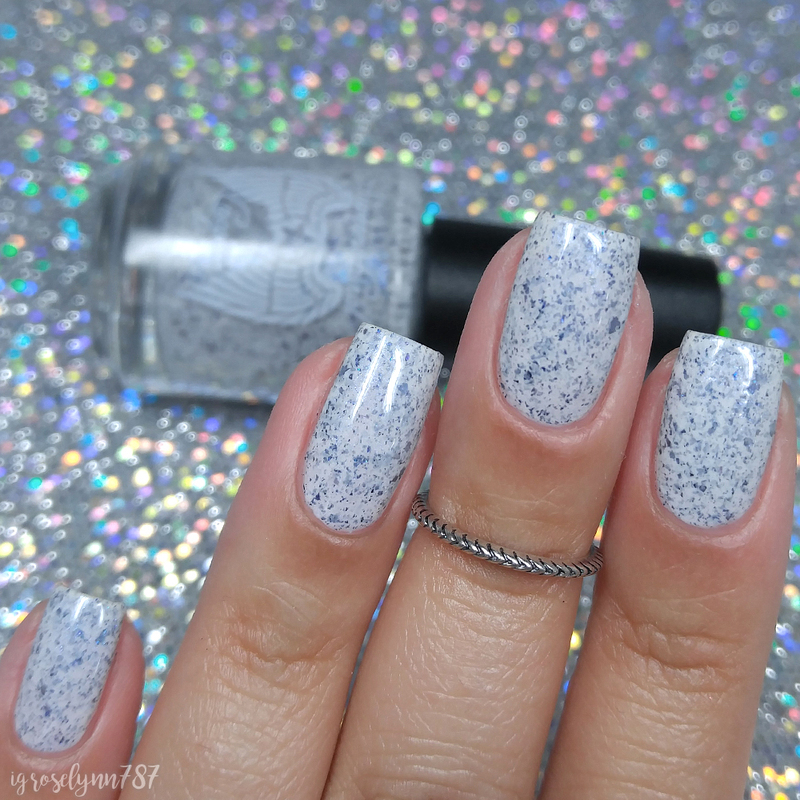 Pretty much think of speckled eggs but with a lot more sparkle and shimmer! I'm so excited about these so let's jump right into the swatches! 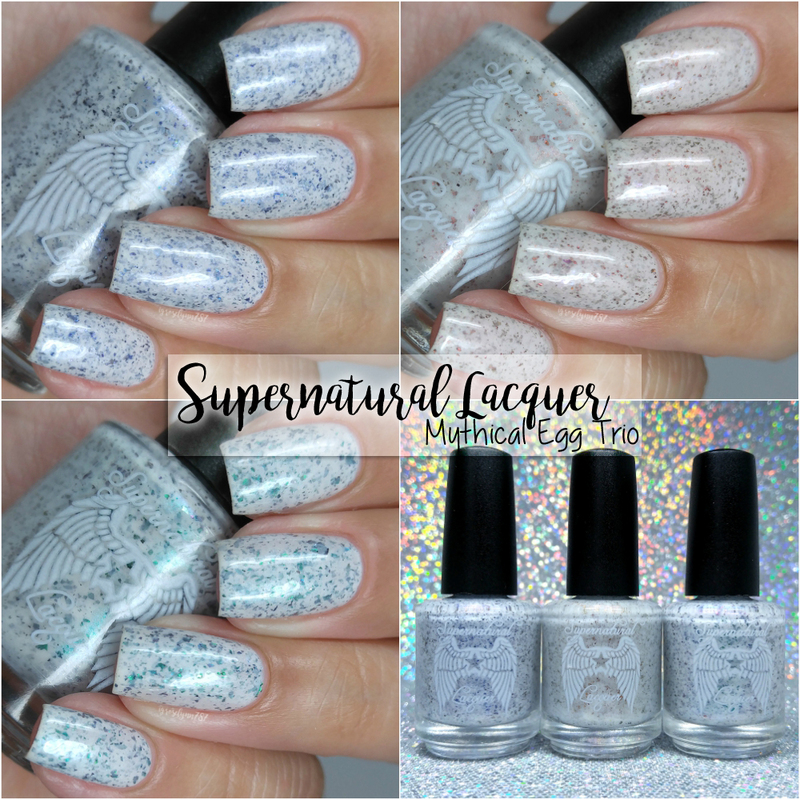 The Mythical Egg Trio by Supernatural Lacquer will be releasing for preorder this Friday, March 24th at 9PM. The preorder window will only be opened until Sunday, March 26th at 9PM EST. Each full-size shade will retail for $11 or the full-size trio can be purchased for $31.50. Gryffon can be described as a white crelly base packed with chameleon flakes, fantasy flakes and duo-chrome shimmer that shifts purple to blue. The formula has an initial sheer application, but builds-up opacity with ease. It's very flakie heavy, but it doesn't interfere whatsoever with the consistency. Fantastic distribution and very smooth throughout the application. It dries down to a bit of a gritty finish, but can be smoothed down perfectly with topcoat. Shown in two coats and sealed with a glossy topcoat. Phoenix can be described as a white crelly base packed with chameleon flakes, fantasy flakes and duo-chrome shimmer that shifts red to copper. The formula has a sheer application, but builds-up easily for full coverage. The flakies felt a little scarce compared to the others, but there is still great distribution throughout the application. Consistency wise it's a little on the thin side, but not runny and definitely very manageable. It dries down a very minimal gritty finish and can be smoothed down with topcoat. Shown in two coats and sealed with a glossy topcoat. Hydra can be described as a white crelly base packed with chameleon flakes, fantasy flakes and duo-chrome shimmer that shifts teal to purple. The formula has a sheer application, but like the others it does build-up really well. 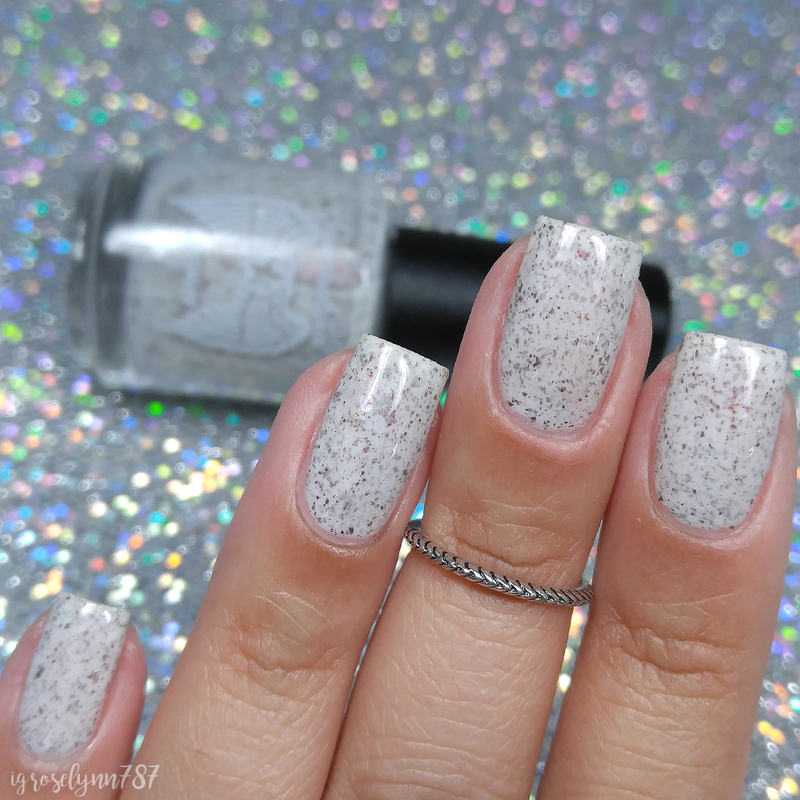 It's super packed with flakies, ranging from small to large shards. The application has a great consistency for layering, not thick at all. It dries down to a minimal gritty finish that smooths out after topcoat. Shown in two coats and sealed with a glossy topcoat. 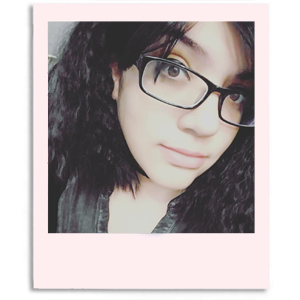 Overall I have to admit I love these so much more than I thought I would. Because they are so similar I didn't think I was going to be drawn to all three, but the color shifting is just gorgeous! Each one of the shades manages to stand up against each other pretty well in terms of formula and color balance. I just can't pick a favorite this time, all three are an absolute must-have. Especially if you're like me and have been craving for something different! To recap, the Mythical Egg Trio by Supernatural Lacquer will be releasing for preorder this Friday, March 24th at 9PM. The preorder window will only be opened until Sunday, March 26th at 9PM EST. Each full-size shade will retail for $11 or the full-size trio can be purchased for $31.50. Remember to use coupon code Rose787 to receive 10% off your order!